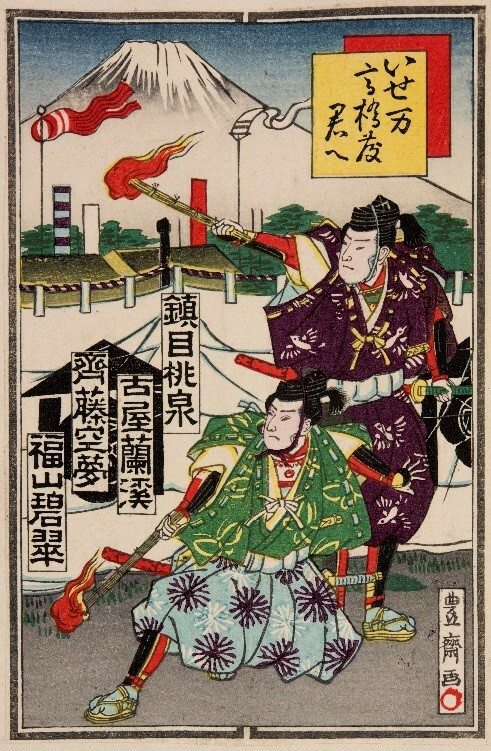 The University of Oregon’s Special Collections and University Archives holds the only known collection of Japanese shrine and temple votive slips (nōsatsu or senjafuda) in North America. The prints were collected by Frederick Starr, an anthropologist from the University of Chicago, who was intrigued by the religious nature of the votive slips and the transmission of Ukiyo-e printing techniques and tropes from the Edo period to the nōsatsu of the Meiji and Taisho eras (1868-1925). 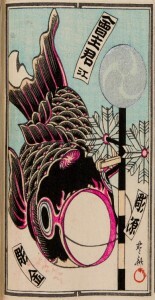 Starr became a regular participant in the nōsatsu exchange clubs (nōsatsu-kai) that were experiencing a revival during that time and, like other members, commissioned highly decorative slips to exchange at meetings. The University of Oregon’s nōsatsu collection represents a significant and important source of primary materials from a time when Japan was in the process of moving into modernity, even as the nōsatsu mages look back with a strong sense of nostalgia to traditional Edo period cultural motifs and crafts. In the fall of 2015, a project to digitize and catalog the prints was initiated by UO Libraries, with the aim of providing wider access to this rare and unique collection on Oregon Digital. Special Collections and University Archives are full of these types of materials and present endless opportunities for discovery and original research. Let us know if you would like to schedule an instruction session or research consultation.